We are still mourning the death of Michael Jackson, so we think it is only appropriate to celebrate this legend’s life by wearing him. In tribute, Intermix has teamed up with e.vil fashion house for an exclusive t-shirt available only at Intermix. 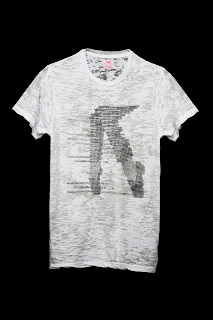 The t-shirt is a limited edition cotton-poly blend featuring MJ’s famous moonwalk—we like that it says “Michael” in a subtle way. The image is studded onto the burnout material and is then distressed to give it a worn in look. It would look super cute with jean shorts during the day or with a pair of fierce heels and skinny black jeans at night. e.vil fans include Madonna, Paris Hilton, Kim Kardashian, Victoria Beckham and many others. Get yours before they sell out! Earlier this week, we featured our dream shoes to go along with our dream vacation….